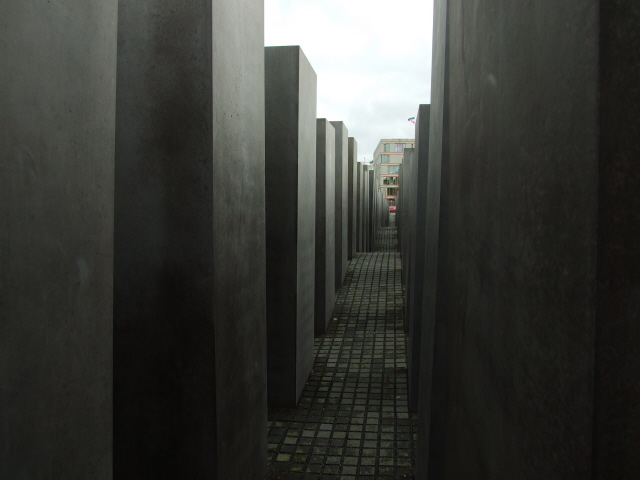 An enormously large memorial to commemorate the even more enormous crime that was the Holocaust. Located right in the centre of Berlin, near the government district and many of the city's main sights, it is quite a statement, despite the design of the memorial being rather abstract – though this is in turn offset by the adjacent Information Centre. The place has become a major tourist site too, not just for dark travellers. More background info: The Holocaust – or Shoah – i.e. the systematic genocidal mass murder of the European Jews at the hands of the Nazis is not only one of the biggest crimes in human history (if not THE very biggest). As Germany, the perpetrator nation, has to bear (most of) the guilt for this crime, it also has a special obligation in the commemoration of this darkest chapter in the history of the country, Europe and the world. 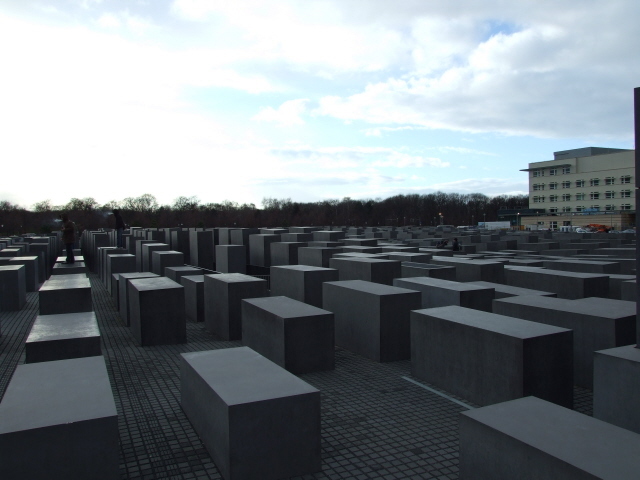 It fulfils this role relatively well these days – but it has taken a long time to achieve the current mostly excellent quality of Germany's many Holocaust-related memorial places, especially at former concentration camps. 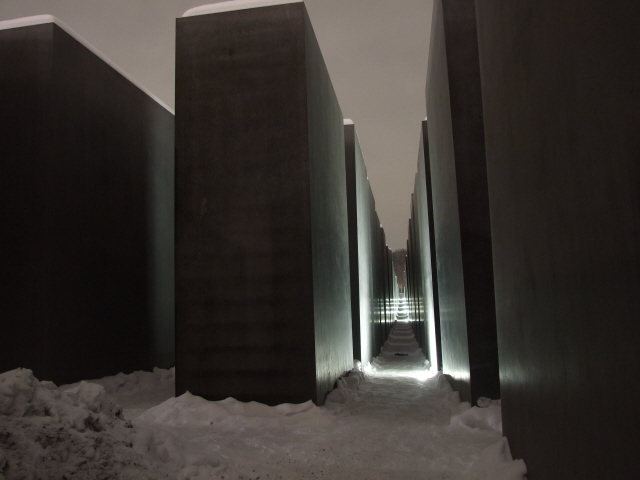 A special, purpose-built, national memorial dedicated specifically to the Jewish victims was felt to be lacking within Germany, however, and it has indeed been unusually long in the making. Suggestions for the creation of such a national memorial date back (only!) to the late 1980s. After a decade of campaigning by a group of historians and journalists, the German parliament finally paved the way for the realization of the monument in 1999 – i.e. after Berlin had been re-established as the capital of reunified Germany. Apparently the time for such a large memorial had finally come. The state also provided the funds for the significant costs of the memorial, nearly 28 million EUR! The location was an early easier decision: an empty field south of the Brandenburg Gate which during the era of divided Berlin and the Wall was part of the "death strip" of the Iron Curtain that sliced Berlin in half. The rest of that former strip either side of the memorial has been built up over the years following reunification – including the new US embassy just to the north. The design options for the memorial itself had been much more a matter of controversy. After several rounds of competitions/calls for design suggestions, at least one of which was directly vetoed by the then government, the rather abstract approach of today's memorial emerged as the winner by late 1997, later approved by parliament in 1999. Work was begun in 2003, and the finished memorial was inaugurated in 2005. 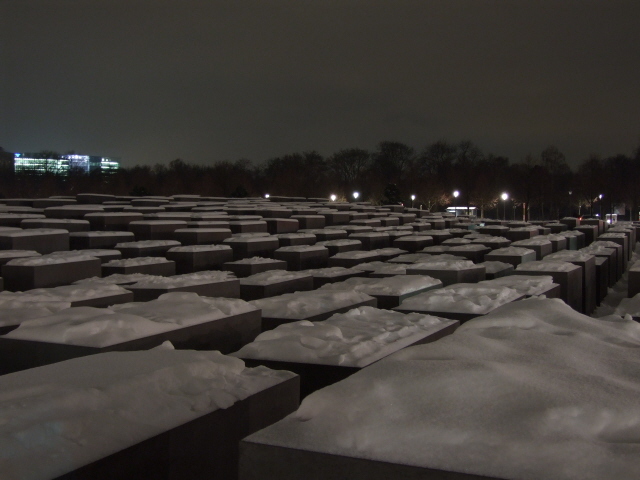 The memorial's ultimate design is the work of Peter Eisenman, a modern architect from New York, USA (i.e. not a German at all, despite the Germanic-sounding name). The abstractness of the design, which lacks any direct, concrete hints as to what it commemorates, has attracted criticism too. Partly for that reason it was decided to complement the abstract monument with an Information Centre of the more traditional memorial museum format, so that people who want to learn about the underlying history can do so. But by constructing the exhibition rooms in a subterranean space, under the memorial, it does not detract from the design's impact. Genuinely unwelcome abuse, e.g. in the form of graffiti, has unfortunately also occurred – but the design of the slabs included the foresight of applying a special surface coating that allows for relatively easy removal of graffiti. On the other hand, the company that supplied this coating was associated with parts of German industry that were involved in the crimes of the Nazis … although that accusation has been defused. The controversy about the size, nature and costs of the memorial have continued, on the other hand. 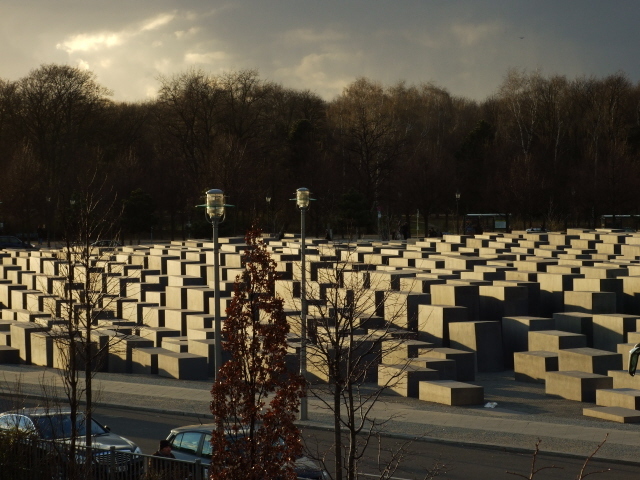 A particular issue is the fact that the memorial commemorates only the Jewish victims of the Holocaust, thus excluding for example Sinti and Roma ("gypsies") or homosexuals. Meanwhile a new separate memorial for the latter group has been set up nearby in the park opposite the Holocaust Memorial – though a significantly smaller one – and one for the former is in the making. The relative sizes of the memorials remains an issue all the same. All these controversies can be expected and are probably just unavoidable when dealing with a subject matter of this graveness and complexity. But the politics surrounding it also remain rather abstract to the visitor. This also means you can experience the place in different ways. You can stick to the purely abstract and appreciate it as an extraordinary design as such. Those who want to delve deeper into the reasons why it is there can do so in the well-designed Information Centre. What there is to see: The first thing that strikes every visitor to the Holocaust Memorial is its expansive, slightly sloped area size. The field filled with a grid pattern of concrete slabs measures nearly five acres. In total there are 2711 concrete slabs (or "stelae", as the preferred terminology seems to be). The figure does not have any specific symbolic meaning, though. The only symbolism is that the field vaguely resembles a mass of tombs … in a very abstract kind of way. The monochrome dark grey has also been interpreted as relating to ash (i.e. a hint at the cremated victims perhaps). There are no overt pointers to the memorial's association with the Holocaust, though. At the edges of the field, these slabs are quite low, starting almost at ground level, but further inside the field they rise to several metres above the ground. The ground is not even, either, and in places it dips down lower than street level. In the middle of the lowest parts and where the concrete blocks are tallest, they assume an almost oppressive presence – which is clearly intended, and further enhanced by the fact that the passageways between the rows of blocks is so narrow that you can only fit through alone or in single file. The blocks are not exactly even in shape either, but very, very slightly tilted, thus involving a hint of disruption of the otherwise prevalent symmetry of the row-of-slabs approach. The solemnity of the design is best felt deep inside it. On the edges less so – as normal life goes on around it, and there are often visitors merrily walking along the top of the slabs ... which you shouldn't do, though. The atmosphere is quite different depending on the time of day and light and the season: I once went on a winter evening, in January 2010, after a heavy snowfall. The white topping of snow on all the concrete slabs altered their appearance and aura noticeably. It also meant that walking amongst them was trickier given the slippery cobblestone uneven ground. The really dark associations of the memorial only reveal themselves when you go down to the Information Centre or "Ort der Information" – 'Place of Information', as it is officially called. Incidentally, some people seem to be under the misconception that the place is associated with the underground bunkers from the Nazi era. Hitler's infamous "Führerbunker" was in fact located a few hundred yards to the south-east (now completely destroyed, but marked by a plaque/information panel put up by the Berliner Unterwelten association – see under Topography of Terror for directions), and a fairly intact part of the associated drivers' bunker was also discovered in the vicinity (but was deliberately sealed off and remains inaccessible – see also bunker museum at Anhalter station). 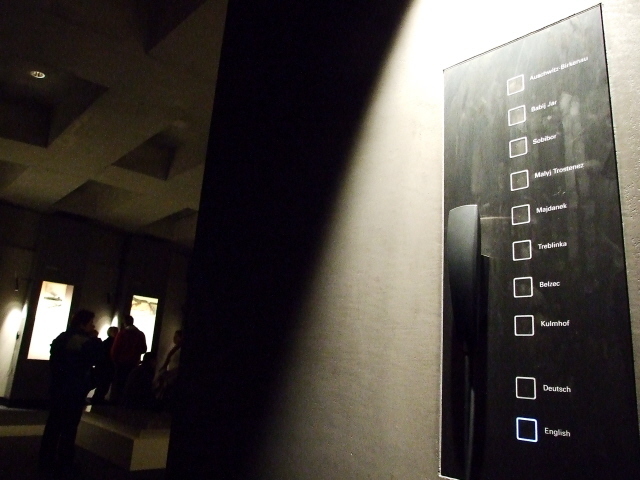 The Holocaust Memorial itself is, however, not related to these former sites in any way. 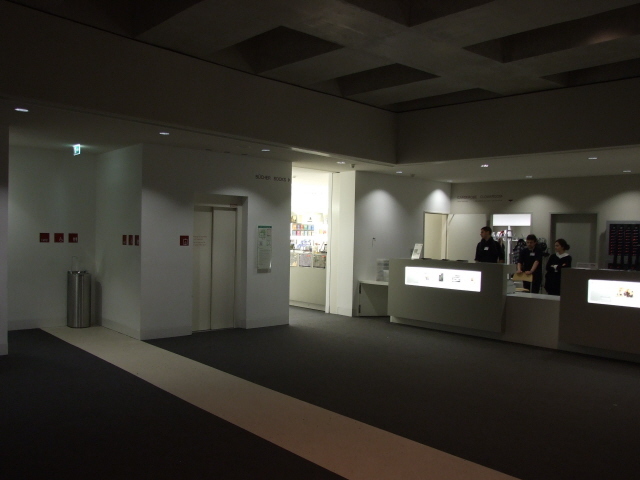 At the reception area of the Information Centre, audio-guides can be hired if you so wish (see below). The exhibition itself is bilingual in German and English – so if you're OK with either language, the audio-guide would not be essential. The texts are self-sufficient enough and the quality of the translations is mostly quite good. The design of the underground exhibition in part reflects that above ground. Rectangular shapes echoing the concrete slabs of the open-air memorial are interwoven into the design at various points. Thematically, the exhibition balances a summarized factual account of the historical developments that led to the Holocaust with a focus on personal stories of selected individuals/families. One room details the most gruesome part of the extermination of the Jews, namely in the gas chambers of the death camps in Poland. There are small booths with single seats and headphones where you can listen to accounts of those places. 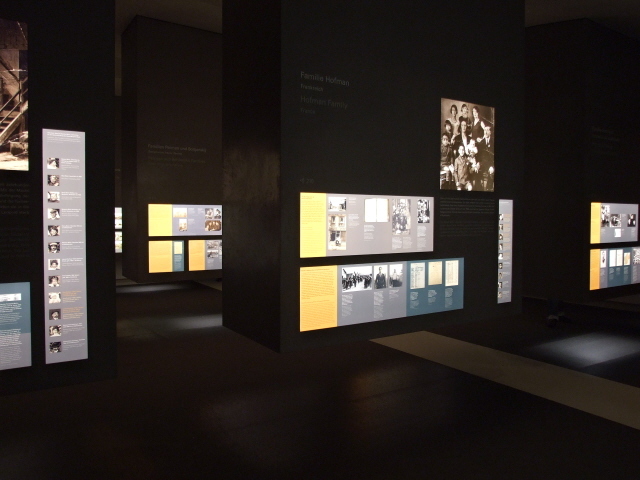 Following the exhibition proper, there is a room which looks beyond this particular site, namely by providing information about other memorial places both within Germany and abroad. Unfortunately, the large chart of such places that is on display lacks an English translation. Incidentally, Yad Vashem, the main Holocaust memorial in Israel, collaborated with the Information Centre of the Berlin Holocaust Memorial, e.g. by providing lists of victims' names. A database can be accessed via an interactive screen. 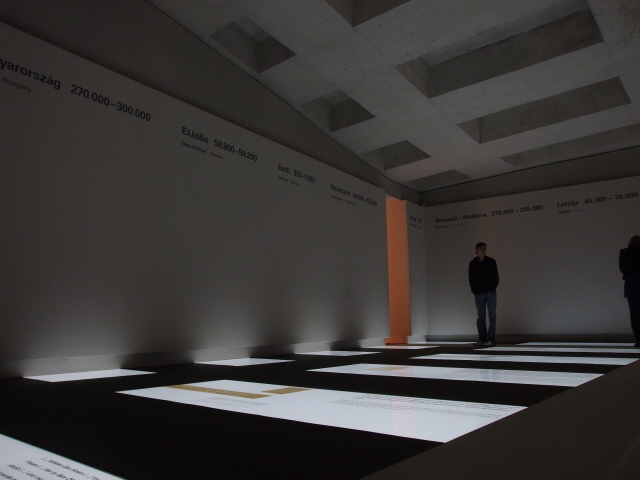 By the entrance to the exhibition there's another interactive station where more information is provided about the history of the development of the Holocaust Memorial in Berlin (see above). A small bookshop complements the exhibition. 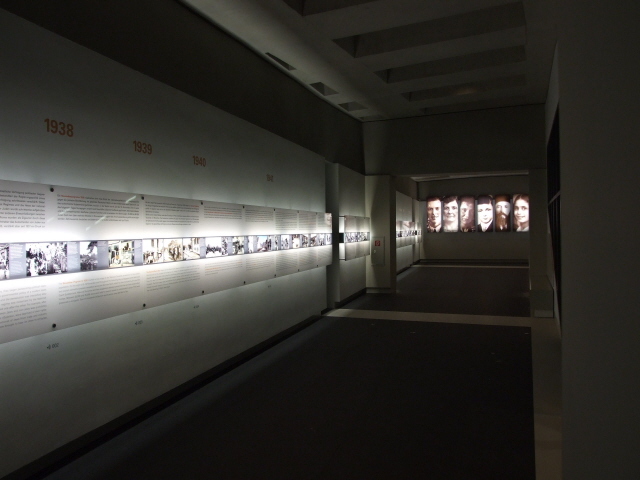 All in all the exhibition is really quite dark – both literally (lighting is very sparse, creating a physically gloomy atmosphere) and figuratively: the coverage of the massacres and death camps in the East is quite gruesome, though not in too graphic a fashion. The breadth of the coverage is fairly good for such a comparatively small place, but there are naturally limits. The summary is quite good, though, so a visit to this Information Centre can indeed be a good starting point for learning about this dark chapter of history. Location: Right in the middle of Berlin, just 200 yards south of the Brandenburg Gate along Ebertstraße, and some 500 yards north of the transport hub of Potsdamer Platz. The memorial as such covers the square-ish area between Ebertstraße to the west, Cora-Berliner-Straße to the east, Hannah-Arendt-Straße to the south and the new embassy of the USA on Behrenstraße to the north. The access to the subterranean Information Centre is in the south-eastern part of this area, with the official address at No. 1 Cora-Berliner-Straße. Access and costs: easy, free admission and guided tours (but fees are levied for hiring an audio-guide). Details: The site could hardly be easier to find – right by some of the city's most major and most central sights (see non-dark combinations below). Various buses go straight past on Ebertstraße, including the convenient lines 100, 200 and TXL. The closest metro (U-Bahn) and regional metro train station (S-Bahn) is Brandenburger Tor, though Potsdamer Platz and Mohrenstraße (U2) are conveniently close too. The main open-air part of the memorial can be freely accessed at all times. Admission free. Free guided tours in English take place every Saturday at 3 p.m. – group tours at other times can be arranged and cost 50 EUR (for up to 25 participants). Audio-guides in English, German or Dutch can be hired from the reception desk of the Information Centre and cost 4 EUR (ID deposit required in addition). 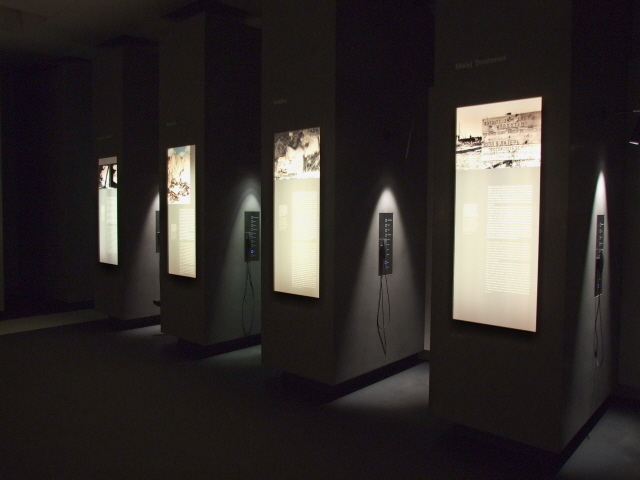 There are also audio translations of the exhibition texts available in languages other than those three (French, Hebrew, Italian, Polish and Russian, Spanish) for 4 EUR. Time required: The exhibition can take anything between half an hour (for a more cursory look) to at least two hours if you want to study all the informational material available in more detail. The optional audio-guide has a running time of 75 minutes alone. The outside site can be viewed in a few minutes – but to properly take it in you should go and wander through the maze of the stone blocks, even get lost in it. That could add at least another half an hour. Combinations with other dark destinations: There are lots of choices nearby. The closest are the Reichstag and one of the Soviet War Memorials on Straße des 17. Juni. Checkpoint Charlie and some of the traces of the Berlin Wall are also within easy walking distance. And so is the place that would also thematically tie in best with the Holocaust Memorial: the Topography of Terror – the newly upgraded memorial museum on the very site of the nerve centre of the Nazis' reign of terror. The place most associated with the masterminding of the Holocaust, however, is far out in the south-western outskirts of Berlin: the House of the Wannsee Conference. Combinations with non-dark destinations: In general see under Berlin – the memorial's location couldn't be more central, bang in the very heart of the city, just south of the principal landmarks of the Brandenburg Gate, the Unter den Linden boulevard and the government district, and just a block or so up from Potsdamer Platz.